In the recent times business bloggers have been so engrossed in producing content for their individual purposes that in this rat race of content and blogging they somehow forget or tend to forget some of the very basic yet important rules of blogging or online scripting. One of the main factors is a faster growing base for all the subscribers. Majority of bloggers do not even know who are the ones following their posts or getting back to them on a regular basis. Have you ever thought how your thoughts are getting percolated in all the other networking sites even without your knowledge? The ones who are doing this are your very own fellow “members” whom you often fail to keep a track and treasure their contributions. It’s really unfortunate to see that many bloggers undervalue their loyal members of his/her blog’s readership. But the most interesting and important fact is that the more you value them the bigger gets the chance to get more subscribers and in turn helps you put on calories for your website. The more the foot-print the better it is for you to fix them into your site. So what are you waiting for! Just follow the below mentioned 32 simple steps to convert your readers into subscribers. Customers or clients always seek out for very easy navigation options, if they find that they need to burn oil just to figure out the process, be sure they will never ever think of getting back to you. So the very basic thing you have to keep in mind is that do not make it painful for visitors to access your blog. Make a clear module for subscribing your blog. Look how Content Marketing Institute displays it. Do this with an RSS subscription tab and a simple email opting form for the readers who would be interested for them. Reduce the pain for your visitors to go & find the subscription box in your blog; they will not only be happy with your content but also with your style of presentation. Once the layout of subscription processes are made easy the next step is to ensure that the steps are very few. In this way you will be reducing the hassles for your visitors who would want to subscribe. Often it is noticed that once a visitor starts filling up the forms for subscription, if he is asked to go though many steps he loses interest and often leaves the page. Whenever a visitor comes to your blog it is very essential that the blog should be able to catch their interest. One the visitor finds that the content of the blog is really good he may want to subscribe. See how Kristi Hines shows the benefits of subscribing to her blog. But again when it comes to money we all think what is that special or convincing factor which one would get after subscription. Therefore always give reasons and convince your customers of the things they would get once they subscribe to your blog. Along with the subscription process and layout the next thing you need to do is to create a committed module to subscribe on your blog. Make a dedicated landing page so that you can administer people via other mediums like social media, other pages on your website, PPC, or email. In this way you can say “Visit myfirstblog.com/subscribe to be the first to receive our latest blog content!” rather than saying, “Visit myfirstblog.com. You are also free to use the extra space on this page to show the specialty of your blog and the benefits for subscription. Incentives are the best enzymes to boost subscribers. We all know how often we really get motivated whenever there is an incentive behind any offer. For your blog you can always use this formula to pull more readers. 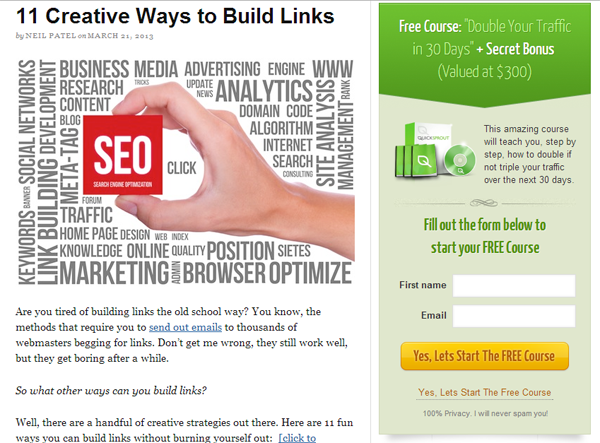 Neil Patel offers a traffic generation free course to entice visitors. Use a dedicated email flyer or a campaign social media, and declare an incentive for subscribing. You can give an exclusive ebook, software downloads, or exciting coupons. Create a dedicated landing page or forum through which if the readers subscribe they might be the lucky winner of surprising gift! This is the area where many bloggers lose out on their subscription opportunities. You will always have to ask or request people to subscribe to your blog if they are not doing so. It is the main desire of the whole effort, so if the desire is not getting materialize then you will have to ask them to do so. But ensure that your words should be very motivating and not commanding. Include a link to subscribe to your blog on other high-trafficked pages of your website such as your ‘About Us’ page and Press Room. These pages will attract a lot of new readers to your blog, so use the opportunity to route them into your blog so they can know more about you and also read all of the amazing blog content you offer. 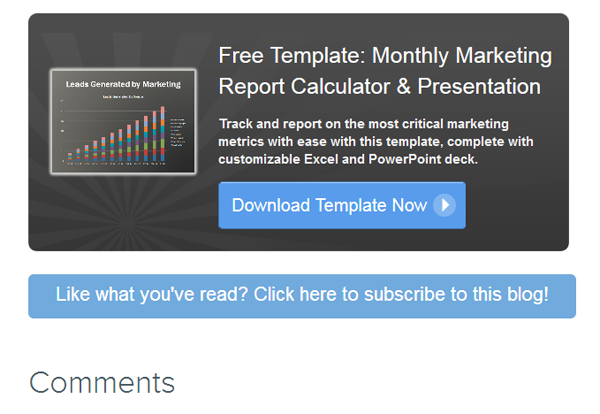 HubSpot adds an awesome subscription vouch below every post. Never forget to add a footer to your blog article. Once the reader finishes reading your article and at the fag end of the article once there the subscription vouch is mentioned then it becomes easy for you to catch the interest of the reader and convert into a sale. This is an indirect way to raise the amount of subscribers to drive more traffic to your blog. The more traffic you drive to your blog the more subscribers you’ll gain. Don’t undermine the importance of optimizing each post you publish on your blog. Refresh your blog SEO, and target the keywords you want to rank for in search. ‘Social proof’ is as the word denotes a confirmation of the people to the actions of others with the knowledge and understanding of the fact that the actions they follow are of good demeanor. Brian Clark users subscriber count as a social proof in his blog. This third-party authentication can be a strong energizer for your site visitors’ and prospects’ actions. You can highlight this social proof into your blog posts for others to see so that they find it convincing for subscribing to your blog. Addition of a CTA and link for subscription to your blog; in your personal email signature, and promote it amongst others in your company to do as well. The email signature I use for my outgoing marketing emails. Use free tool like WiseStamp, to create a dynamic email signature which includes an RSS feed, showing the title of your most recent blog. It will automatically get updated as and when any new article gets published. 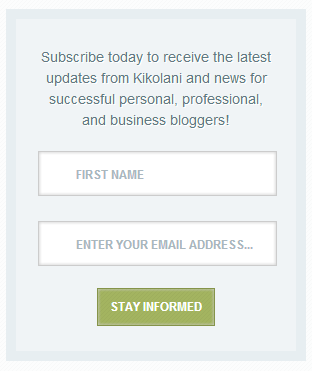 Include blog subscriber promo into your social media updates. You should promote the dedicated subscription page wherever your online presence is there. Share it in updates regarding your blog posts and invite others to comment on them. Twitter, LinkedIn, Google+, and Facebook are the most popular places to incorporate your blog links. 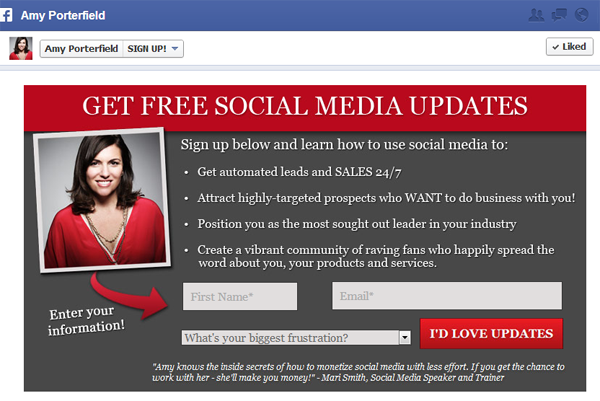 This is how Amy Porterfield grabs email addresses on her Facebook page. You can even create a committed tab on your Facebook page and amass subscriptions within Facebook! This is something your readers will do for you without much of your effort. This is another indirect way to promote your blog online. If one reader finds it really interesting then he/she can share it with is friends just by clicking a button. Therefore add social sharing buttons to every blog post which you publish, so that your readers can easily advertise your blog content to their networks which will bring some very prospective subscribers for you. Guest blogging is undoubtedly always a powerful link-building tool. But you can extract guest blogging options for more than just the inbound links. It’s not necessary that in the beginning all will read your blog, but if you tag your comment while posting on another author’s post, people can directly come to your website just to peep in and find what you have in your platter to serve them! This way you can always generate a good amount of subscribers for your own blog! 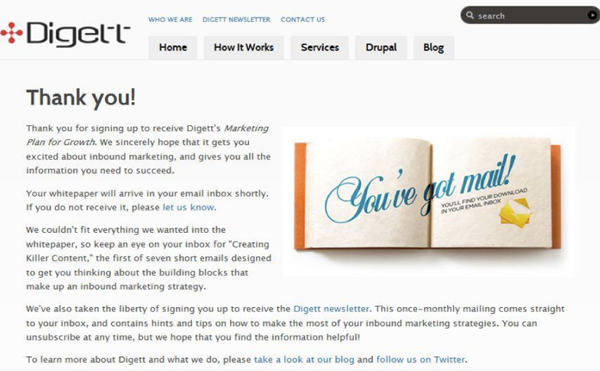 See how Digett uses their “Thank You Page” to encourage re-conversions. Thank-you pages are the pages wherein your visitors get redirected to after they’ve completed a form on a landing page. As a result, these pages are prime space to encourage re-conversions — especially blog subscriptions! It’s a great way to boost blog subscribers while also continuing to nurture leads. Include subscription CTAs within some of your other content such as your eBooks, webinars or other free downloads. Similar to the other footer at the end of your blog posts, this will help you to realize on the people who are already keen in your content. Once they are convinced with one of your content which they’re already consuming and consider it to be valuable, they’ll prefer to subscribe to the other content which you offer on your blog. You can always do a push for blog subscribers using different promotional channels, and arrange it like a contest. Offer an exciting prize to a randomly selected subscriber, who subscribes between promotional launch date and an assigned date. By this you can always get not only more subscribers but also some foot print into your website. Poor content can never convert into good content; this is what a first time reader will get an impression if the content of your blog is not of good quality. So ensure that a quality is, maintained and you keep on improving it every moment. This is what we all as consumers look for. A good content can always draw good subscribers! Lee Odden opines that, one needs to publish good quality of content in order to fetch more subscribers as there is a very though challenge wherein people try to pull more subscribers in order to be in the lead. The best way to keep your subscriber base rolling on is by consistently publish new content. Subscribers always have an expectation of consistency. Therefore if promising new subscribers don’t find that you’re constantly publishing new blog content, they will not be anymore interested to visit or subscribe anymore. So all the hard work you had done to attract them goes down into drain. And don’t forget publishing regularly can always reward with something more than just mere subscribers. Good look is always a great weapon to draw the eyes of readers. So give a perfect style or look to your blog. Make a good template for your website. You can bank upon good designer to ease out the work for you. Put some paid marketing muscle behind your subscriber push. Use PPC to funnel traffic to your loyal blog subscriber landing page, or influence Facebook Sponsored Stories to drive traffic to the subscriber tab you created for your Facebook business page. Whether to provide RSS feed or not is a much debatable topic. A partial feed only shows the link and bits of your blog, whereas the full feed RSS shows the entire blog and is more user-friendly. But on the other hand partial feeds help you to draw more traffic. While there are always opposing viewpoints to this topic but it is advisable to provide a full feed RSS just to be on the better side of fetching some concrete subscribers. Begin a podcast related to your subject matter, make it into into iTunes and enlist them into the various podcasting directories. Do not forget to mention your blog in every episode and mention the benefits of subscription. Try to make some interviews with popular names in your niche. This way you will be opening up a new channel for promotions, but also will be creating bonus content which can be reused as part of your moral bribe campaign for fresh subscribers. Michael Stelzner does this awesome podcast on Social Media Examiner by interviewing experts in his niche. This is one of the most old, tried and tested concept is self promotion. You can always post your comments and opinions on various forums. You place yourself as an active presenter in almost all forums. In this way you come to the direct notice of the crowd and people start taking interest in you, which in turn will motivate them to come to your blog and discover the more of you. This is perhaps the most overlooked strategy for gaining traffic and subscribers. Avoid bothering other bloggers for links. You can do that initially for someone out of benevolence, and if that person returns that favor gradually you can develop a cordial business relationship with the author and even become good friends. Many people hate pop-up windows. It gets very annoying to your frequent site visitors who have to always see a pop-up coming unnecessarily. Derek Halpern uses this modal window on Social Triggers. You need to keep in mind that the majority of visitors to your site are new and they might not like this at all. It helps you to attract the attention of your first time visitors and also you have a lot of space to show them the benefits of signing up to your blog. You should try this if you haven’t till now. 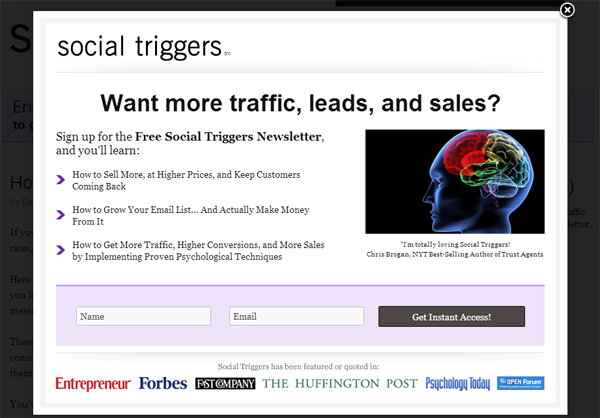 The first one to introduce this amazing box which increases subscribers; was Derek Halpern from Social Triggers. It is the box between the site’s header and your content. It attracts attention, and you have a big place to share with your reader what will they get from subscribing. 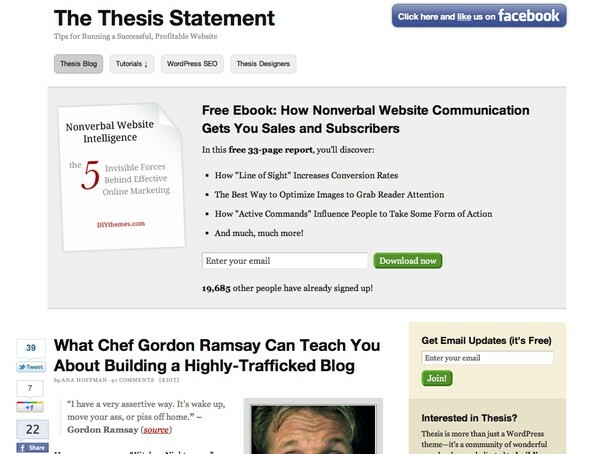 You must have heard about HelloBar which appears at the top of your blog. This is the best place to ask your readers to subscribe. Channelize them to a page which will show them what will content they will get and ask them to subscribe. You can do this right at the end of the page so that they go through the entire page to see the content and if they like it they can subscribe. Blog commenting can be a sure way to accelerate your blog subscribers if it is done effectively. Below mentioned are some handy tips which will help you increase your subscribers just by commenting on other blogs! Create a direct link with your blog once your commenting on other blogs, so that the readers can come to your blogs directly. Be constant with your blog commenting efforts. Initially people won’t take you seriously or your comments but once they find you presence very active they might think of visiting your blog also. It just worked for Me.! Use an avatar. Pics or manifestations are always catchy! If you have an avatar people will see it everytime you comment and they will instantly now that it is you who is commenting! Be very cautious with your comments. Do not say something just for the heck of commenting. You will lose your ground and people might not take you seriously. Therefore always give insight into the blog and try to connect directly with the author. You have to remember that you should be able to impact not only the readers but also the author. Use your URL in your name when you leave a comment. For example, I would type “S. Saha @ Webaholic”. As we all know seeing is believing, similarly here also if your readers find you working with big shots or stalwarts, their respect for you will increase drastically and you will gain popularity like anything. People like Darren Rowse, Brian Clark, Rand Fishkin, Neil Patel (there are so many names I can think of but hard to include in one post) are the ones with whom if you work or you are into networking, instantly you will be taken seriously by people and your readers will take you seriously and subscribe your blog. It is the main mantra of the day; anything is sale-able once you have famous people buying it. This logic applies to the world of blogging also. Invite guest authors or bloggers to visit or comment on your blog. They will bring along with them some of their readers who might subscribe with you also. But its not always necessary that all the readers or visitors will convert. Moreover we all like felicitations, so these guest bloggers can really pull in the crowd for your blog also. Most often whenever a reader likes you blog or that matter any blog they always like to contact the blogger. So always be very open to receive them and absorb their suggestions. After all they are the ones for whom you are working so hard! Listens to them, address their queries and always try to ensure that they feel at ease while interacting with you. Good post Saha, Thank you for sharing it’s very usefull. I wrote a french post about How a Designer Optimizes for Conversion and there are similar points. Thanks Sebas! Glad you found it helpful 🙂 While getting more subscribers one needs to optimize for conversation. Because subscribers are very similar to leads who have interest in what you say.